I’ve been sent some rather delightful magic vegan potions to try out from Sirius Therapies. Plus you lucky people get the chance to win some of these gorgeous goodies on here, twitter & instagram. Read on! So I ‘met’ Emma Salt (below) who created Sirius Therapies on twitter and we instantly connected over kids, animals and juggling making a living with family etc! Emma lives in Derbyshire with her husband and two boys, a lab, rescue ponies and rescue hens. 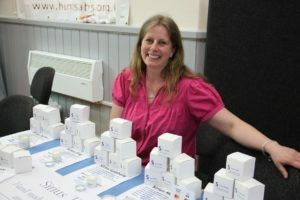 She’s a qualified teacher, sports massage therapist and aromatherapist (for humans and animals) and now a maker of beautiful lotions and potions. Wow that’s quite a CV Emma! So…Emma sent me some of her creations down to Devon to try and I’ll be sharing them with you over the next few weeks. 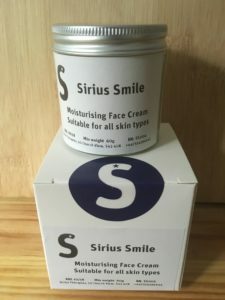 To start with – I’ve been using Sirius Smile moisturising face cream (pic above) for a couple of weeks and believe me just a tiny bit goes a very long way. It’s suitable for all skin types and is full of nourishing, natural anti-oxidants, plant butters and essential oils. It smells absolutely amazing with geranium and myrrh amongst the plant based ingredients. I use it on my face after my shower in the morning and it’s perfect for my 45 year old skin which I’d class as normal with a couple of dry areas! This giveaway closes at midnight on Tuesday May 1st 2018 and we will randomly choose one lucky winner the next day and post the prize out to them. It’s only open to UK residents. Best of luck. Looks like a great product made by a lovely lady! I’d love a chance to win thank you 😊! This sounds beautiful; have been looking for a non harmful natural moisturiser for a while now and would love to try this! 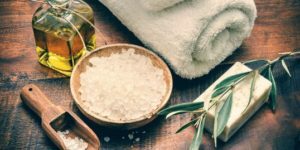 Is it suitable for people with eczema? If so count me in pls! My skin gets so thirsty. This sounds just the tonic! I have to say that I love the scent of geranium, so this face cream sounds delicious! Fingers crossed.